The iPhone's built-in keyboard lets you insert accent marks and other diacritical symbols in any iPhone app that uses it. This is very useful when you're writing in French, Spanish, or other non-English languages. 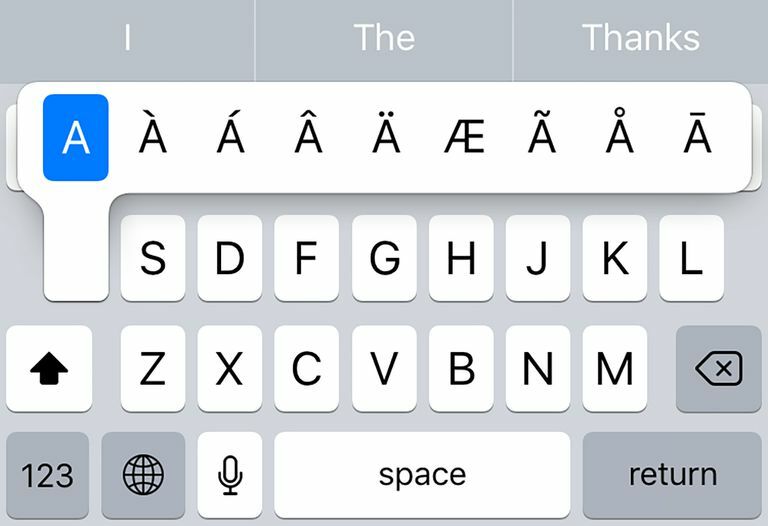 Every iPhone has a set of accents and alternate characters built in, but they're not immediately apparent on the keyboard, but they're easy to find. First, make sure you're using the iPhone's default keyboard. If you haven't installed any third-party keyboards, you're ready to go. If you do use a third-party keyboard, you'll need to use the third-party keyboard's option to switch to the iPhone keyboard. To see the available accents and diacritical symbols, tap and hold the letter or punctuation mark you want to add the accent to. A row of accented versions of the letter will pop up. If nothing pops up, that letter or punctuation does not have an accent. To insert the accent you want, keep holding your finger down and slide it across the screen to the accented letter you want and then remove your finger from the screen. If you've got an iPhone with a 3D touchscreen, such as the iPhone 6, 6S series, 7 series, 8 series, or iPhone X, this is a little trickier. That's because a hard press on the keyboard activates a cursor that you can move around the screen, not the accents menu. On those devices, be careful not to push too hard on the screen when you tap and hold a letter. Doing that will make the phone think you're trying to use 3D Touch, and it won't show the accents. On those models, a light tap and hold is best. The accents and special characters that come built into the iPhone are good for many uses, but they don't cover every option. If you need advanced mathematical symbols, arrows, fractions, or other specialized characters, you'll need to look elsewhere. There are a number of third-party keyboards that offer these characters. Symbols offers over 3,000 symbols for music, fractions, math, technical documentation, emojis, and more. Symbol Keyboard isn't a third-party keyboard, but instead is a standalone app packed with over 60,000 special characters. Copy and paste a symbol from the app to use in other apps. It is a free app with in-app purchases available. Uni Keyboard provides 2,950 currency symbols, mathematical operators, checkmarks, arrows, and more.